Always a shame to hear that one of the local independent eateries has shut up shop. Such was the recent fate of Frangipani at the start/end of the main drag in Woodbridge, one of the first ten cafes we visited all the way back in 2007. Too easy, p'raps, to lay the blame at the coffee chains further up/down the road. 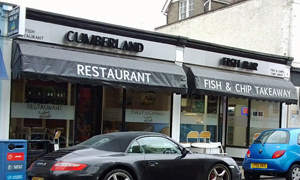 No matter 'cos the Cumberland Fish Bar, all classy black and white retro lettering, has taken over that infamous double facade. Cleverly it's both a sit-down restaurant (to the left) and a takeaway (to the right). Choose your door carefully. At 1:30pm on a drizzly day, me and Andy claimed the last free table for two. Must be doing alright already. Helpful chap comes over to take our order from the laminated menu. Drinks first: hold up, did you say grape soda? From Old Jamaica? Two of those, please. As you'd expect, you've got your fish, got your chicken, got your kids' stuff. Not for the first time, Andy proves himself partial to the cod roe. With mushy peas, natch. Needing sustenance, I'll have the beef & onion pie and chips. Half a point removed for suspected use of non-Heinz ketchup, tut-tut. Wait for food is well worth it: everything's piping hot and super fresh. Looking over Andy's shoulder, I recognise the bloke who runs the Riverside restaurant, a Woodbridge Star In A Reasonably Priced Fish Bar. He's being very complimentary about his piece of skate. Note that he's also sipping a glass of wine since, as it says on the window, the CFB is fully licensed. And they're open all day seven days a week. As if all of that wasn't enough good stuff, they can make you a decent cup of coffee too. Quality F&C. If it was a car -- Humber Pullman. If they were passing by -- Robson Green.